President Donald Trump's decision to fire FBI Director James Comey is sparking outrage among many Democrats, and even a few Republicans. Jodi Hernandez reports. President Donald Trump's decision to fire FBI Director James Comey is sparking outrage among many Democrats, and even a few Republicans. 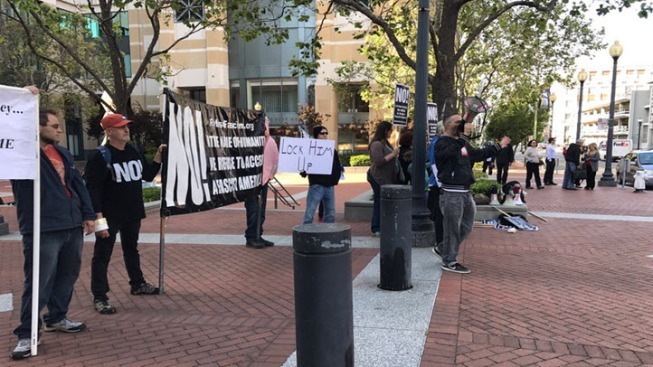 The Comey firing prompted several protests, including one outside the federal building in Oakland on Wednesday. "I hope this is the straw that breaks the camel's back," said Xochito Johnson with the group Refuse Fascism. Congressman Eric Swalwell called Trump's firing of Comey an abuse of the highest magnitude. The East Bay congressman believes Comey's investigation into possible Russian ties to Trump's presidential campaign may have been making the president a little too nervous. "I wish I could say I was surprised, but frankly I'm not," Swalwell said. "Most people will see this as Director Comey and his investigation may have been getting too close to the president and his family, and his campaign." Swallwell and others are now calling for an independent prosecutor to take over the probe. "Let an independent investigation proceed, and if there is no evidence to support that the president or his campaign were involved with Russia's interference, it's in his interest that come forward," Swalwell said. "And if there is evidence, then it's in our country's interest that anyone who is responsible is held accountable." House Majority Leader Kevin McCarthy (R-Bakersfield) said he spoke with Trump on Tuesday night, and the president said he'd lost confidence in Comey. McCarthy said just a few months ago, many Democrats felt the same way. "I would argue Comey made the FBI political," McCarthy said while attending a Politico event in San Francisco. "I personally think when the FBI director thinks he becomes also the attorney general and the prosecutor, he's probably overstepped."